Join us Tuesday, October 30 at 6:30 p.m. at The Black Sheep (164 Water Street, St. John’s). 18+ event. Free admission. 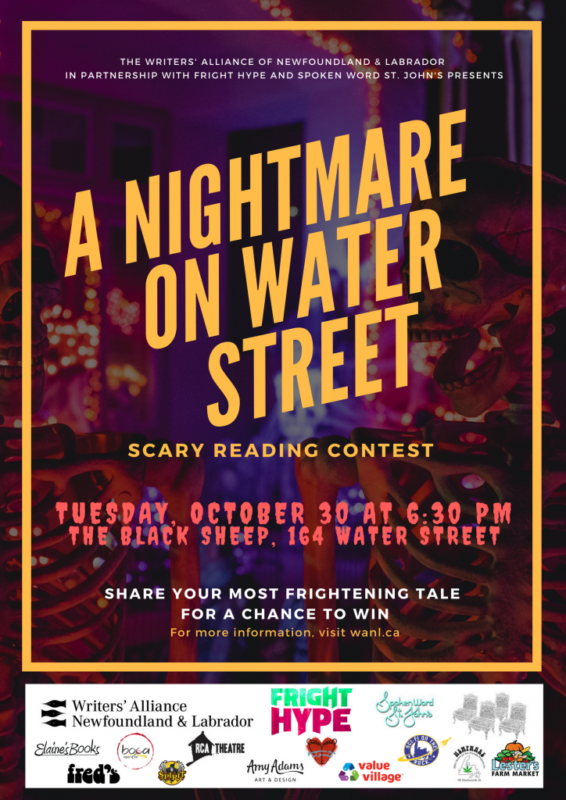 This Halloween Eve, we’re putting off a SCARY READING CONTEST and a COSTUME CONTEST. Costumes will be judged by host and horror expert Mike Hickey of Fright Hype. Bonus points if you come dressed as a spooky literary character! See the Contest page for details about the reading contest and prizes. Presented in partnership with Fright Hype and Spoken Word St. John’s. Prizes generously donated by Boca Tapas Bar, Resource Centre for the Arts, Value Village, Sci-Fi on the Rock, Elaine’s Books, Fred’s Records, Hempware, Amy Adams Art & Design, Spirit Halloween, and Georgestown Cafe and Bookshelf.